Are you lost in your wardrobe? I can be. (Happily, of course.) 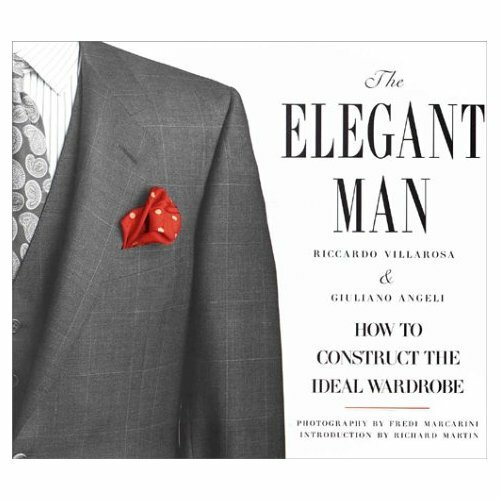 It would be hard for me to narrow down what is absolutely necessary at a bare minimum in constructing the ideal wardrobe. But there are a few pieces that I think are essential to build the foundation of the elegant wardrobe. From idea by Tim Gunn, these are the ten things in my wardrobe that I cannot do without. 1) A chalk stripe suit. Most of mine are grey, ranging from light to charcoal, but two navy chalks have slipped into the lineup and I find them to be more formal. 2) A navy blazer. I’ve got six. Linen, “fleece”, wool… double and single-breasted. I love the MTM DB. It must be my Simon Templar fixation. 4) Linen, natural coloured “jeans.” I know, I know. But this is my “go-to” casual travel/outdoor drinks party pair. Paired with a favourite sportcoat, blue shirt and Tod’s driving shoes, I feel ready for an impromptu flight to the Continent. 5) Linen or cotton/linen trousers. A must for steamy summers in Virginia. Mine are cut along the same lines as my favourite flannels. The side straps are far more comfortable than a belt when it gets really humid out. Since they are a bit heavier weight they rumple instead of wrinkle, which I find perfectly acceptable. 6) A classic tuxedo/dinner clothes. Those of you who read one of my answers to the tagged post will know that I own far too many dinner jackets. But, I never feel more elegant than when I am wearing my dinner clothes. My latest is midnight blue with grosgrain peak lapels. 7) Suede shoes. Usually in brown. A natural match for the grey flannels. I have about five pair, and it’s a toss-up between a full-brogued oxford Church’s and a monkstrap Bally. Because suede is inherently more casual than hard leather, a monkstrap is a good choice for a second pair of “casual” shoes that can look dressy if need be. 8 ) Good loafers. My Sebago Penny Loafers, in cordovan. Can’t beat ’em, they hold their polish very well and are as comfortable as slippers. 9) Belgian slippers, in black. They do double duty with dinner jackets. And there is nothing more comfortable to wear on a flight. 10) A crisp white shirt. Button-down, spread collar, straight collar, cut-away… it just doesn’t matter. Everyone looks great in a blindingly white, crisply pressed shirt. A spread collar with French (double) cuffs can also work under a dinner jacket in a pinch. 11) A great coat. Mrs. E. has threatened me with serious repercussions should I come home with yet another coat. My full-length, double-breasted, peak lapel, half belted back camelhair polo is far more comfortable and warm than any of my dressing gowns… I’d really love a Chesterfield though… I wonder what are “serious repercussions” exactly….? What are the pieces that you can’t do without? This entry was posted in Cultivating, Elegantology and tagged Basic Men's Wardrobe, The Elegant Man, Tim Gunn. Bookmark the permalink. Recently discovered your blog and it begins my morning everyday with a smile. Sulka pyjamas and dressing gown–made all the more essential for the inability to replace them. And Stubbs & Whooten shoes which I not only wear at home but are my “go to” casual shoes in the summer. Again, thanks for your delightful perspective. Long time listener . . . first time caller. As our lists are a lot the same, I figured I would post mine . . . .
Vintage Schott brown leather aviator jacket…possibly my #1 choice… Hermès copied it…unsuccessfully…nothing beats an original. Khaki slacks. Charcoal grey flannel slacks in different weights. Levi’s 501 jeans in various stages of faded from inky dark and new for dressy, to faded, frayed and broken in. Land’s End Oxford cloth trim-fit shirts, and plain white fine cotton dress shirts. Real English bridle leather belts…they don’t show a buckle mark, even with constant use! Darkest plain charcoal suit, darkest plain navy suit. Harris tweed herringbone sports jackets…the most durable, artisan-crafted, forgiving, and versatile material. A darkest blue herringbone tweed can do anything, sometimes more, than a navy blazer. Classic Burberry trench in navy (better for evening), and one in tan. Sebago beef roll loafers. The plainest high gloss black slip-on shoe: the simpler and more highly polished, the more elegant, in the understated Beau Brummel manner. Something that relates to my cultural or ethnic background such as flag or emblematic cufflinks, lapel pin, university tie; for example Europeans in loden, Irish in Aran knits, Scottish family tartans, etcetera,…it is charming and it is admirable to be aware and proud of one’s heritage! Something quirky, colour-saturated, or “off,” like purple cords, Lilly Pulitzer prints, Orvis critter pants, Porthault print pocket square, orange summer slacks, the new Ray Ban Wayfarers in aqua! A fine list SwF. I especially like your mention of something “quirky.” And I kick myself for not buying one of those Ghurka bags with my employee discount at BGT. I have always admired a man for the longevity of certain items, my father-in-law wore the morning suit of his wedding to my wedding and also bequeathed some wonderful tailored shirts and suits to my husband. When things are well made, of good quality, and taken care of, they can age over time beautifully. I would rather have one well made suit than 5 mediocre. First, where are you sending your Barbour jackets for re-waxing? Second, my husband would add to these very good lists of wardrobe basics his hunting clothes and something in scarlet and cream for game day Saturdays. None of this is terribly elegant, but all seriously necessary for a satisfying life. His father bequeathed a fabulous shotgun to him, and it will undoubtedly be passed on to our son, along with a treasured thick black cashmere sweater and a watch. I inherited and wear my father’s Navy peacoat from WWII. The buttons, which were sewn on by my father on day one of service, are outstanding. Hello Paula, the jacket will have to go back to Barbour unless I choose to do it myself. Those peacoats are fantastic and will see duty for several lifetimes. Well thank you very much Ms. Durbin! High praise coming from you. I have yet to tweet. Hope you’re having fun with it.